HILL, CHARLES, businessman, politician, judge, and jp; b. c. 1748 in Londonderry (Northern Ireland), son of Robert Hill; m. first Rebecca (Cochran? ), and they had four children; m. secondly 18 Jan. 1800 Isabella Allan in Halifax, and they had one child; d. there 16 Aug. 1825. The brothers Robert, Charles, and Patrick Hill were probably among the 300 Ulstermen whom Alexander McNutt* brought out from Londonderry to Halifax in the autumn of 1761. The three eventually settled at Upper Economy in the district of Colchester, where each was allotted 500 acres on 24 March 1768. Charles Hill was again in Halifax by 1776, where he was joined by his young nephew Robert. Hill was probably associated with the brothers Thomas and William Cochran, merchants of Halifax, from the very start of his business career; they had perhaps been responsible for his coming to the town in the first place. (The identity of his first wife as a member of the family can only be presumed.) In September 1778 Hill and Temple Stanyan Piers (father of Temple Foster*) entered partnership as auctioneers. The association lasted until Piers’s premature death in July 1786, after which Hill continued alone. By 1790 he was recognized as one of the four main auctioneers in the town. Houses, lots, general merchandise, and even black slaves were disposed of by Hill “At his Auction-Room” and elsewhere, but after the outbreak of war between Britain and France in 1793 a high proportion of his business began to be taken up with ships captured by British naval vessels and privateers. Several auctioneers were authorized by the Vice-Admiralty Court to deal with prizes, and they presumably received a fixed percentage of the sums realized. What is certain is that Hill became a rich man, one who was later reputed to have sold more condemned prizes than any other auctioneer on the continent. As a supplementary activity, from about 1790 Hill was established as a money-lender. Probably about the same time he was engaged in the lucrative West Indies trade, but this endeavour was subsidiary to his other interests. Thanks to his prominence, Hill was one of the directors of the stillborn Shubenacadie Canal Company in 1798 [see Isaac Hildrith*], and of the Fire Insurance Association of Halifax in 1809. After the latter became the Halifax Fire Insurance Company in 1819, Hill served as its president from 1820 to 1822. Commercial success in due course led Hill into politics. He represented Amherst Township in the House of Assembly from 1786 to 1793 but, like Richard John Uniacke Sr, Charles Morris, and other members of the mainly Irish oligarchy that had developed during the 1770s, he did not contest the election of the latter year. Hill remained out of politics during most of the ascendancy of the loyalists under the lieutenant governorship of Sir John Wentworth*. Unlike his friend Uniacke, however, Hill made his peace with Wentworth, who recognized his influence and importance by appointing him to the Council in 1807. Hill retained the position until his death. In 1809 he served ex officio as a judge of the Vice-Admiralty Court when it sat in special session for the trial of Edward Jordan, who had been accused of piracy. Hill also held various minor commissions, among them four as a justice of the peace. At some time Hill had taken his nephew Robert into partnership, and in 1808 Hill’s only surviving son, Charles Samuel, also became a partner in the firm, which thenceforth was known as Charles and Robert Hill and Company. Robert died in 1812 and Charles Samuel in 1816, and by 1822, when Hill was no longer taking an active part in business, the firm, now known as Charles Hill and Company, had failed. Charles John Hill, son of Robert, had taken over direction, but got into serious financial difficulties and eventually found himself in debtors’ prison. Commerce and politics aside, Hill was prominent in the Charitable Irish Society, of which he had been a founding member in 1786. He served as treasurer from 1786 to 1799, president in 1799 and from 1801 to 1803, and secretary in 1820 and 1821. 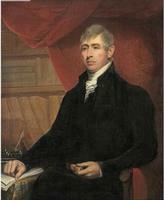 With Uniacke he formed a committee to revise the society’s constitution. At some time Hill was also a member of the Rockingham Club, a convivial institution founded by Wentworth in the 1790s and revived under Lieutenant Governor Lord Dalhousie [Ramsay*]. Hill’s mansion on Hollis Street, with its distinctive Palladian window, survived until 1960. It was apparently the scene of many lavish entertainments, to one of which Uniacke is alleged to have borne a spinet on his shoulders. The ties between the Hill and Uniacke families were strengthened when Richard John Uniacke Jr married Hill’s only surviving daughter, Mary Ann, in 1821. On Hill’s death the Acadian Recorder published a long obituary which stated in part that few individuals had possessed “the good-will and esteem of the public” as had Hill, and lauded his “honorable, candid and generous character.” The tribute was a measure of the respect in which he was held, not only by the more liberal press but also by the community in which he had flourished and which he had served so long in both business and government. Hill’s remains were interred in St Paul’s cemetery, where the tomb can be seen today. The last will and testament of Charles Hill is remarkable for the size of the estate, which amounted to over £113,000, mostly in mortgages on local property, private notes from Halifax merchants and tradesmen, and British and American stocks, and for the nature and variety of its bequests. Hill not only established a trust for each of the grandchildren of his late nephew Robert but he also left money to each of the major denominations in Halifax. In matters of religion he seems to have been both large-hearted and broad-minded, rare enough attitudes among Haligonians of his time and after. Halifax County Court of Probate (Halifax), Estate papers, H110 (Charles Hill) (mfm. at PANS). PANS, MG 1, 469C; MG 3, 154; 164–65; MG 4, 46–47A; MG 20, 65; RG 39, C, 1817, box 130, Hill, Charles, notes. St Paul’s Anglican Church (Halifax), Reg. of baptisms, marriages, and burials (mfm. at PANS). Acadian Recorder, 20 Aug. 1825. Directory of N.S. MLAs. A. W. H. Eaton, Families of Eaton–Sutherland, Layton–Hill (New York, 1899), 15–16. Akins, Hist. of Halifax City. Marion Moore, “Hollis Street building once elegant residence,” Mail-Star (Halifax), 24 Oct. 1960: 3. J. B. Cahill, “HILL, CHARLES,” in Dictionary of Canadian Biography, vol. 6, University of Toronto/Université Laval, 2003–, accessed April 22, 2019, http://www.biographi.ca/en/bio/hill_charles_6E.html.